GET IT DONE IN 20 CLASSES! Only we have the QTALK Method and it will make you verbally communicative 10 times faster than traditional methods! You 'll speak in complete sentences from the first lesson ! Our unique approach includes recall practice tools so that you aren't sitting there reading or taking notes!! You are speaking the entire time - learning grammar by using it! 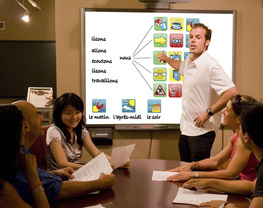 We use visuals to get you speaking and the class is provides English translation at first so you feel very comfortable. We transition into immersion as you progress. You'll participate in simple dialogues right away. You will be able to describe your work, family, friends, hobbies and more with the present tense and the future! You'll express your needs and desires with greater sophistication and in a wider array of conjugation. If you've taken the language before, even if it's been a while and you are comfortable with short phrases about your life and basic conjugation concepts, verb + verb infinitive and masculine vs. feminine articles rings a bell, Level 2 is probably for you. If you feel you need a brush up before, a few privates can do wonders! You'll increase your conjugation to other subject pronouns (he/she, we, they, you plural) your vocabulary with an additional 150 new words, the present progressive (I am eating.) and the preterite form of the past tense (I ate at 2pm.) And l'imparfait (I was eating.) We'll have you speaking with more in depth descriptions of plans, feelings, objects, and places. use of the conditional and subjunctive tenses is introduced and conversation practice, grammar and vocabulary expansion is done organically using media - articles, songs, video and discussions about them. Again, if you have been exposed to all the prior tenses but want to brush up before joining a group, a private or 2 can generally catch someone up who has been previously familiar with the material. Our One-of-a-Kind QTalk Stories and revolutionary way of practicing a wide array of tenses, idioms and other expressions will have you feeling like a native in no time!